Are you beginning to think about your holiday plans this winter? Did you seek an educational and safe experience for your child? This winter, Brillantmont International School is hosting a one-of-a-kind six or seven week intensive language programme in the heart of French-speaking Switzerland. Join our incredible team in Lausanne for daily French learning, fun excursions in the Swiss winter wonderland, and the opportunity to make new friends and connections from all over the world. 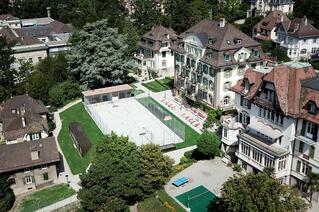 Why attend our Swiss boarding school this winter? Brillantmont has a long and strong history of running a hugely popular summer school on our Swiss boarding schoolcampus. However, there are large regions of the world that have their long school holidays in Switzerland’s winter season. Therefore, this year we are extending our language programme into a winter course. Have you always wanted to send your child to summer school in Switzerland but never had the holidays line up right? This is your chance! Switzerland is a wonder to behold in this magical season. In the heart of the Alps and sprinkled with countless lakes, Switzerland looks like a fairytale land. Small villages lie nestled in the snow and the cities are lit up with twinkling lights and colorful traditions of delicious seasonal food and festivals. One of the other big attractions of attending boarding school in Switzerland is the safety and security of the country as a whole. For centuries, Switzerland has been a haven for families and businesses from environments of less stability. Schools in Switzerland have provided exceptional educational opportunities both in and outside of the classroom for students from across the globe. Knowing that your child is secure in Switzerland can be a huge relief for many parents. Students can fly into Switzerland on direct flights to Geneva where school staff pick them up and ensure their short transfer (45 minutes) to the boarding school. The public trains are fast, timely and secure as well, should families prefer to bring their child in person. At our winter boarding school in Switzerland, your child will experience a new sense of independence and freedom in a family-like atmosphere with exceptional support, supervision and safety. The small size and prosperity of Switzerland allows the values for comprehensive security, efficient infrastructure, and personalized care for all its citizens to flourish. This is also found reflected in the smaller boarding schools in the country. Swiss schools that stick to a smaller size are able to lift up the diversity of experience, culture and language that comes their way, and celebrate each individual and their true potential. Brillantmont International School is a small boarding school in a multicultural Swiss city, which allows for incredible personalised attention given to all students. The small staff to student ratio ensures that every child gets to know their teachers and boarding staff well and provides the ideal environment for the best possible learning, personal, and social support. The best boarding schools in Europe ensure this kind of attention is given to their programmes. And because of this strongly held value, the Brillantmont winter course has limited space available. One of the other key benefits of a Swiss boarding school programme is its internationalism. Switzerland is an incredibly diverse country with four official languages – French, German, Italian and Romansch – as well as home to large numbers of international businesses and non-profit organisations. This rich multiculturalism is found reflected in Swiss boarding schools as well. A six week programme at a Swiss boarding school will not only provide your child with the opportunity to experience studying abroad, tasting the excitement of a new culture, but it will also leave them with friends from all over the world – friendships that last a lifetime. The winter programme at Brillantmont is a perfect balance of learning and fun. Mornings are spent in French class with many opportunities to put these lessons to work in the surrounding city and with native speakers at the school. Since French is the official language of the Romandie region around the school, and France can be seen directly across Lake of Geneva, there is no better place to feel immersed in the rich culture and language of French speakers. Just like our long tradition of summer school has shown, this six-week learning opportunity gives students a boost in their language abilities and a newfound confidence as they enter back into language classes in the regular school year. Afternoons and weekends of the course are filled with fun activities and excursions. Programme activities include sports classes, class trips to discover a local attraction and weekend winter sports trips to snow board and ski. Let's not forget indoor games and socialising in smaller groups in the warm, friendly boarding houses. 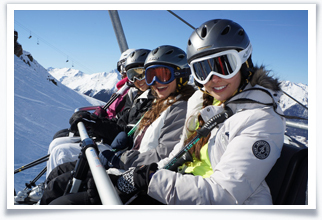 The seventh week of the programme is an optional ski week! Students will spend this week with their new friends at Zinal, a traditional Swiss ski resort that boasts 120 km of ski slopes of all levels. The whole recreational area also includes snowshoe trails, cross-country skiing pistes, a freeride area, a natural skating rink, and an amazing icefall. Want to learn more about studying in Switzerland this winter ? Download the complete winter course boarding programme information.